This evening, my daughter and I went out for a glorious walk. First of all, it is actually (and finally) spring. The days have been so gray recently that a nice day was more than welcome. The temperature was warm, and the trees have begun to bloom. Buds, leaves, flowers, the works. So many people comment on the amazing fall foliage in New England, but I believe the colors of spring rival those of a beautiful fall day. But it was dark, and our walk didn’t involve seeing the spring trees blooming in bright green, deep red, and the flowers were not visible. It was dark, but on Friday night in spring in a college town, there is much life. Our first interesting encounter involved a little brown rabbit sitting on the lawn not far from the sidewalk. It was still and waiting, seemingly staring down a female student who was also still and waiting. She looked our way, and I smiled at her, but she did not acknowledge us. She was in deep telepathy with the animal. We continued our walk. As we approached the chapel, we could hear choral music flowing out through the open door. The stained glass glowed from the light inside the building. “Let’s go check it out!” I said, and I picked up my pace. My daughter held back, thinking I was going to go inside to listen. I only wanted to see if the front door was open and listen for a bit. It was, and we did. We continued to wander, but nearly wandered into a party. So we turned around and went back in the other direction. We talked about life and college and finding a campus where there is a lot going on rather than one where students go home every weekend. And then we wandered by a second building that was hosting a concert, this one instrumental. From every building we walked past, we could hear conversation or music or laughter. We passed two men taking a picture of a building that was nearly all glass and fully lit. We wandered into the neighborhoods where there was a family party with men laughing around a fire pit and children playing with light sabers. It’s spring. Things are coming to life, and it was wonderful to be out walking with one of my favorite people. So far this spring, I filled more than all of my free time with a demanding graduate course, which is winding down. The final presentation is done. After this weekend, I will have only to revise the project and write a paper. I can see the end. And I can see a bit more free time to enjoy the nice weather with my favorite people. And to blog. I can’t wait to get back to my blog! It was one of those crazy conversations that starts at the dinner table. The cat was outside, sitting at the end of the walkway waiting to come in, as he so often does. W got up from the table and let him in. When he closed the door, he said, “There. Now we are in lockdown for the night. No one goes out. No one comes in.” He sat back down at the table to finish his dinner. “If that’s the case, you’d better lock the door,” I told him. Rather than get up, he leaned back in his chair, attempting to reach the door. He couldn’t quite reach, and the chair nearly toppled. “You’d better get up to do that,” his sister advised. “Or you’re going to be the one going out. To the hospital.” W heeded her advice and stood to lock the door. “Or maybe,” she continued. “We’ll have to explain to the ambulance drivers why they can’t come in. GO AWAY! We’re on lockdown!” she demonstrated. “True,” I said through my laughter. By the time I got up from the table, I had completely forgotten about the “lockdown.” The cat was once again meowing at the door, and I let him out, clearly not thinking. I turned from the sink to see two kids looking at me. I shrugged sheepishly. “I forgot about the lockdown.” But then we noticed the cat going after something outside. He had clearly spotted something of interest, and he was hurrying toward it. I had been baking for an event at work, and I was sweating, so I took the opportunity to go see what he was after. “Mom, you can’t go out. The lockdown!” the kids reminded me. “I’ll just be a minute,” I told them. “I want to see what he is after. DON’T lock me out. There is no lockdown.” And of course, in my mind, my word was the word in this house since I pay the bills. 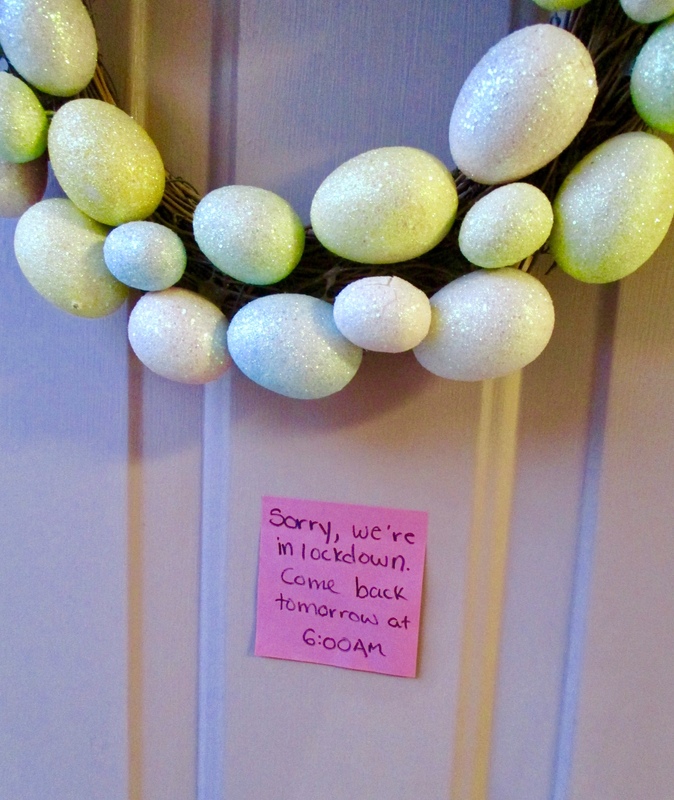 Nevertheless, I returned to a locked door and a sticky note. “Sorry. We are in lockdown. Come back tomorrow at 6:00 am.” Are you kidding? That’s a long time to be outside without a jacket. Yeah, they let me in. If they hadn’t, I would’ve gone to the neighbor’s house. I keep a key there just in case my kids do something crazy—like declare a lockdown and refuse to let me in! I am happy to say that I have found a solution to my mug problem. I now have new mug from which to drink my coffee and reminisce in the mornings. As the weather grew warmer and spring was definitely arriving, the Christmas mug—despite the sentiments it held for me—was starting to feel a bit wrong. There was snow and a Christmas wreath on the mug, but outside, the weather was reflecting an altogether different season. So on my last, rather timely trip to visit Mom, I acquired a new old mug. 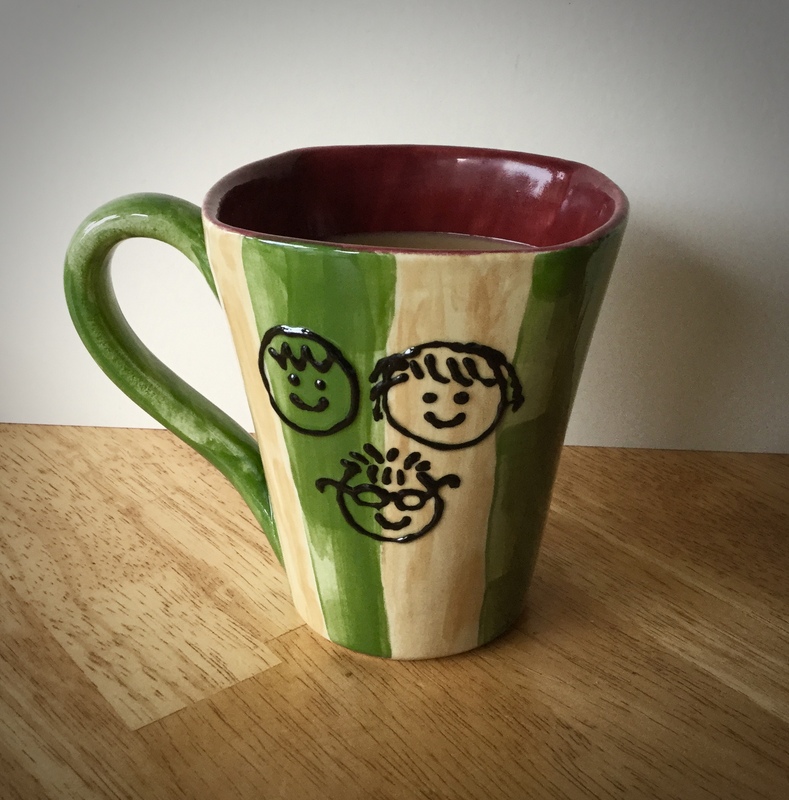 This mug was Dad’s and is one that I made back when my children were little. That Christmas, I made several similar but unique mugs to give as gifts. I painted faces (which barely resembled) my three children, and I included names of the grandparents. This mug—the Grampa mug—is now mine. I thought it would be the perfect replacement for my Christmas mug. 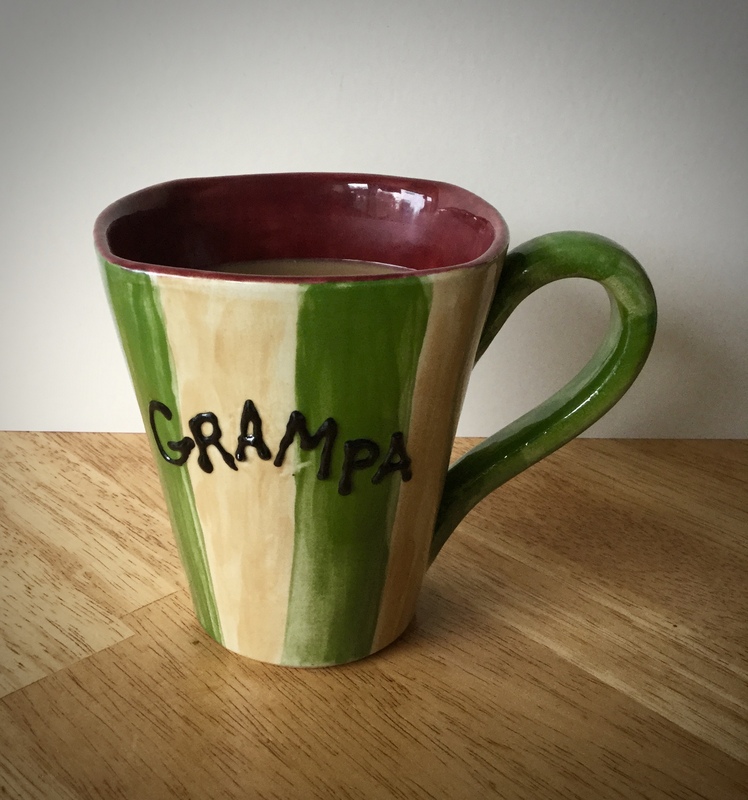 My sister questioned whether I would actually use a mug that says “Grampa” on it, and admittedly, it might seem a bit odd. Here I am, a woman of a medium age, using a mug made for a Grampa. Do I care? Not at all. I use it every day! I think it might just help in my healing process. The conversation started out innocently enough. We were talking about the grades my daughter earned in the third quarter, which ended on Friday. Of course, nowadays, with programs like PowerSchool, there really are no surprises when it comes to grades. If parents open that report card and don’t know what their kids’ grades are, they’re not paying attention. But then my daughter stared talking about a student in her AP English class who was missing much of her work for last quarter because she just didn’t hand it in. Or something. This particular student was ranked number one in the class last year, but this year… not so much. If you’re wondering why a child would choose to slack off junior year—the year that is probably the most important, as far as college admission goes—read on. The rest of the conversation is quite telling. While the subject continued on grades and class rank, the focuse shifted to my youngest. “I’ll bet you’re valedictorian in your class,” my daughter said to her brother. Her tone was almost accusatory. “No I’m not,” he assured her, and he named the student who is. “Well, you’re just a freshman,” she told him. “Your classes are easy and you don’t even do any homework. Wait until junior year. The people who are working hard now will get overwhelmed and start to struggle. Then you’ll be valedictorian.” She seemed pleased with her logic. “But you don’t want to be salutatorian, either,” his sister cautioned him. “There’s really no point. If you aren’t number one, may as well go for third. Then you won’t have to give a speech, and you won’t have to be second.” If there was such a thing as an audible wink, she would have inserted one here. And that explains why the top student in the class might slack off junior year—apparently, it’s all about the speech. And this is where I insert an audible groan…. This is the time of year when winter releases the many captives it has taken during the long, snow-smothered months. One never knows what will appear when the snow melts, and sometimes the discoveries can be downright surprising. Two winters ago, I recovered a cell phone that had been buried in the snow for the better part of the winter. When I turned it on, it still worked, though the service had been disconnected weeks earlier by its owner. My challenge then was to find the owner and return the phone, which I was ultimately able to do by finding common contacts. When my children were young, I found a wallet plowed into a pile of gooey brown road-slush. I took it home to dry it out and find its rightful owner. The wallet contained cash, credit cards, and identification, and I don’t think the man’s wife was pleased that a strange woman was calling her husband relatively late at night—at least not until she found out the reason for my call. The next day, I delivered the wallet to the bakery cafe where the man worked, and he gave my children each a large cookie from the display case. 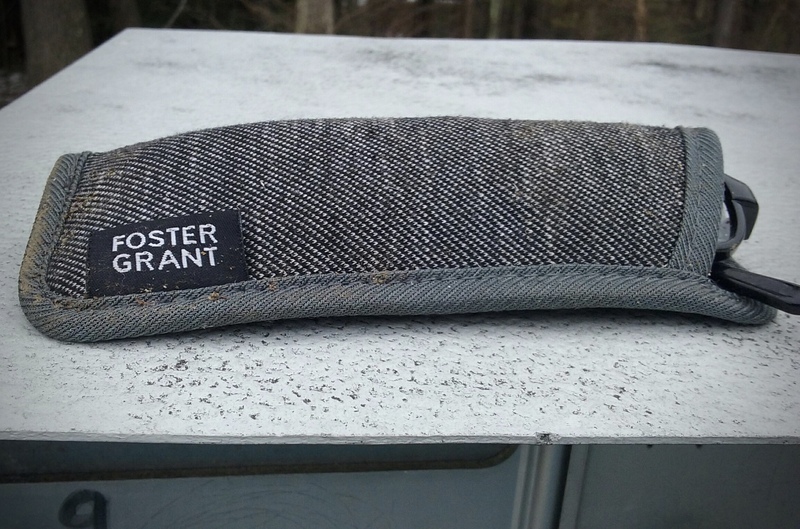 One night this week, when I stopped at our mailboxes on my way home from work, I noticed a pair of eyeglasses in a case sitting on top of the box. The case looked naggingly familiar. It pulled at the memories contained in my brain, and as I dragged out the heavy box in which I store all useless tidbits of memory, the lid squeaked from lack of use. Interestingly, memories can slip into the storage box nearly unnoticed, but getting them out again can sometimes take great work and strain. The memory started to emerge: A month ago—maybe two—my BF appeared at my house with new reading glasses (because we are at that age, and reading without them is challenging). He had purchased a new pair because… well, because he misplaces them. All. The. Time. These new glasses were contained in a nice case. But the next day, the glasses had gone missing. BF seemed to think he had left them at my house, and he launched a futile search. I tried to tell him the glasses weren’t there, but he wouldn’t believe me until he didn’t find them there. He then thought he had left them in his car, but I never saw the glasses again after that. Until now. Because now, they were sitting on top of the mailboxes, dirty from the weeks spent in the snow, but they were intact, unbroken, and in good shape. Luckily, it seemed they had not been plowed into a snowbank or run over by a car. And the case had done a good job of keeping them free of scratches. BF now has them back. At least for now. Sometimes, I am amazed that anything can emerge intact after months buried in snow. And sometimes, I just wish winter would give up the fight and release the spring…. Every now and then, I get a glimpse of one of the things that my children have missed in their lives. Because my children have been brought up almost exclusively by one parent, there will always be things that I could not provide and attention that they did not get. This weekend, I took my daughter out to buy a prom dress. The dress was one she had picked out several weeks ago, and one that we almost didn’t get. Not because she didn’t want it, but because it almost wasn’t available. As we walked into the store, we found only two of the desired style on the rack, and both were the wrong size. My daughter briefly seemed to think she could make the smaller of the two work, but I was doubtful. Nevertheless, we made our way to the fitting room to try it on. Because it is prime prom dress season, there were piles of cast-off dresses littering just about every available surface throughout the store. As we walked by the register, I spotted another dress like the one she was about to try on. Amazingly, this one was her size! 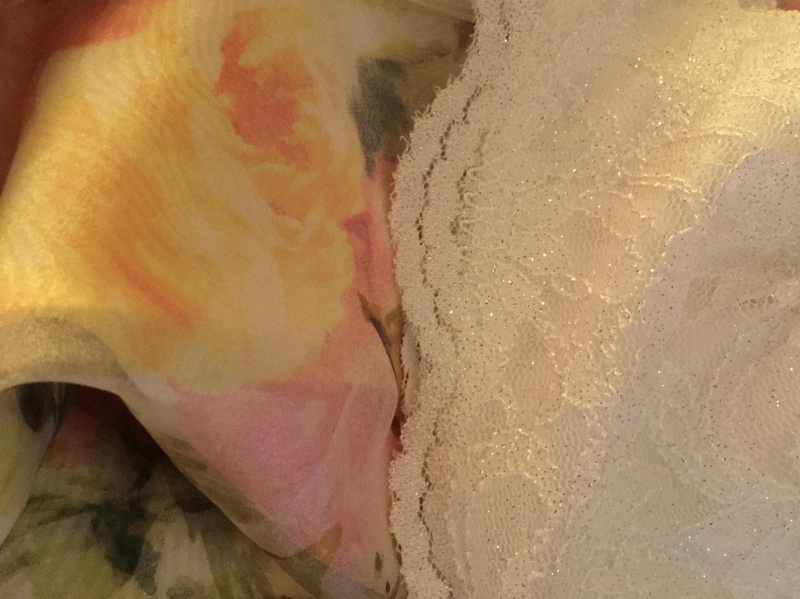 When we arrived home with the dress, I had this crazy flash of memory that caught me off guard and allowed me to glimpse something from my past that my kids are missing. When I was young, Mom would take us shopping for clothes (new school clothes, special occasion dresses, etc.). Later that day, when Dad got home from work, we would model our new clothes for him. He always had some approving comment like, “That looks sharp!” or “That’s a great dress!” Always, he was positive and supportive of our outfits and our emerging sense of style (no matter how odd or colorful). Always, he was supportive of us. Every now and then, I get a glimpse of what is missing, but I pause and remind myself of what my children have. Not all children have the same memories, but they will still have memories that are unique to them and to their experiences. Hopefully, no better or worse. Just different.